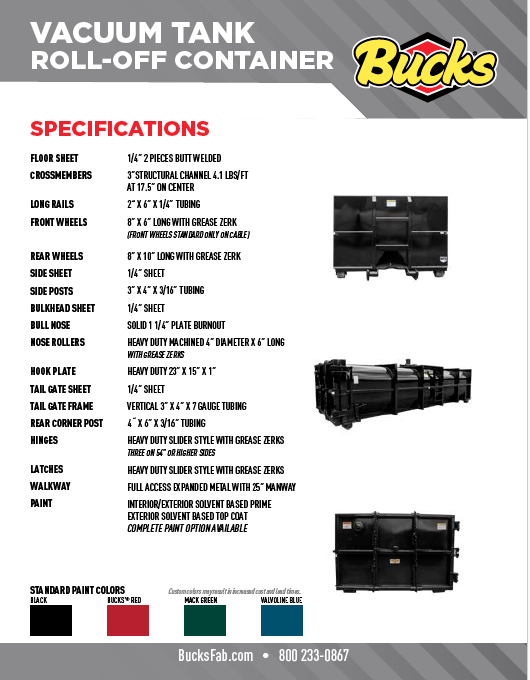 The Bucks® Fabricating Vacuum Tank design is built off of a test done with up to 24.5 inches of HG. Vacuum Tanks are used to safely transport and store waste materials. This container will safely transport and store hazardous and nonhazardous (wet or dry) materials such as oils, sludge, chemicals, liquid waste, and other environmentally harmful materials. Our units were tested with up to 24.5 inches of HG, which maximized the full draw of the tank, for 10 minutes with no leakage and no failures.